Musical Chairs release date was Friday, March 23, 2012. This was a Limited in theaters release. 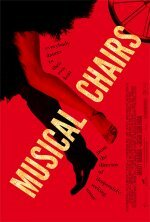 Set against the backdrop of competitive ballroom dancing, Musical Chairs is about Armando a Bronx-bred Latino who aspires to be a dancer but whose only way in is as handyman at a Manhattan dance studio, and Mia, an Upper East Side princess who is the studio's star performer.